Along with her two sons grown, Kirstin Guanciale took time for herself, for a little adventure and some self-discovery. Guanciale, a senior payroll specialist in the Payroll Service Center, traveled to Argentina last fall for a volunteer opportunity in which she worked with seniors in a community center. 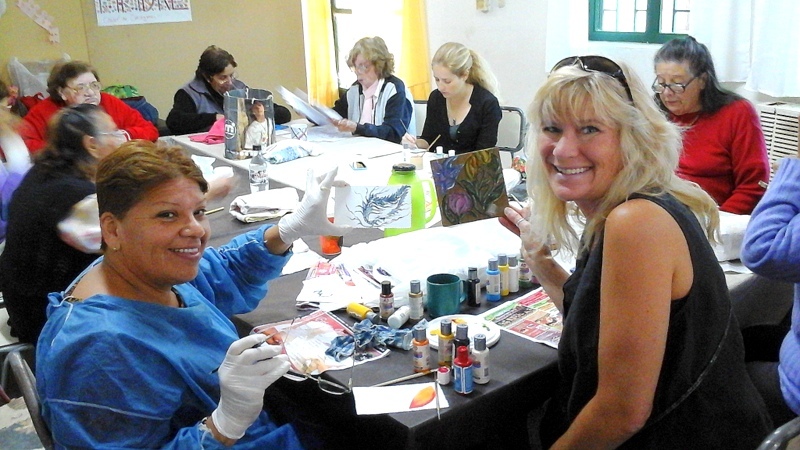 Along with enjoying her time engaging with the men and women, the experience allowed her to learn a different type of art and gain some new perspectives. The new skill garnered her the vote of Most Popular artwork at the campus’s On My Own Time exhibition in May. 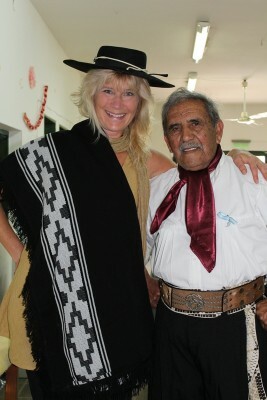 Kirstin Guanciale poses with a community member during a trip last fall to Argentina, where she volunteered at a senior center. Guanciale had always wanted to travel since she was in college, but raising a family with her husband, Tony, put things on hold for a while. More recently, with both sons, Jamie and Lane, in college, she decided to take the time to pursue traveling and tie in volunteering. 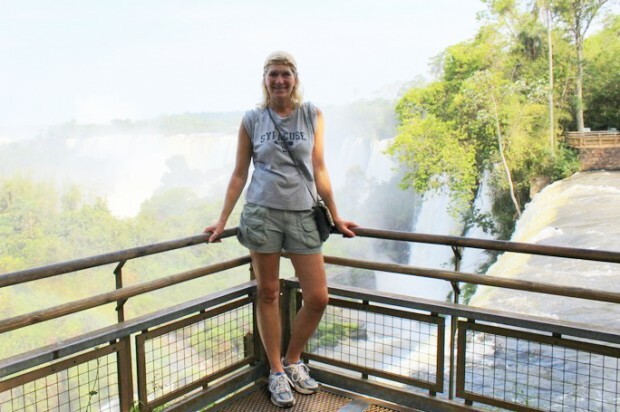 Guanciale invited her former college roommate, Ginny Moccia, to travel with her to Argentina. They signed up with an international volunteer website, which placed them in a small village, Ville Allende. They spent the first two days in Buenos Aires and then traveled to Ville Allende, where they stayed for two weeks in a hostel setting. The two friends went to the senior center each day to spend time with the community members—engaging them through crafts, having conversations and taking part in special events, such as a special Mother’s Day party. Guanciale would often spend time with a retired art teacher. “She was always painting or drawing. I was an art major as a freshman in college, so I gravitated to that,” she says. “We would sit together and she showed me a technique she used. She outlined flower petals on a heavy cardboard-like paper. She used tools to carve up edges around the picture, creating an outline that became three-dimensional,” Guanciale says. The raised pieces are then painted. Kirstin Guanciale and a community member, Kristol, display their artwork during Guanciale’s trip to Argentina. “She encouraged me to try it and I just kind of took to it and kept with it until I finished the piece,” Guanciale says. 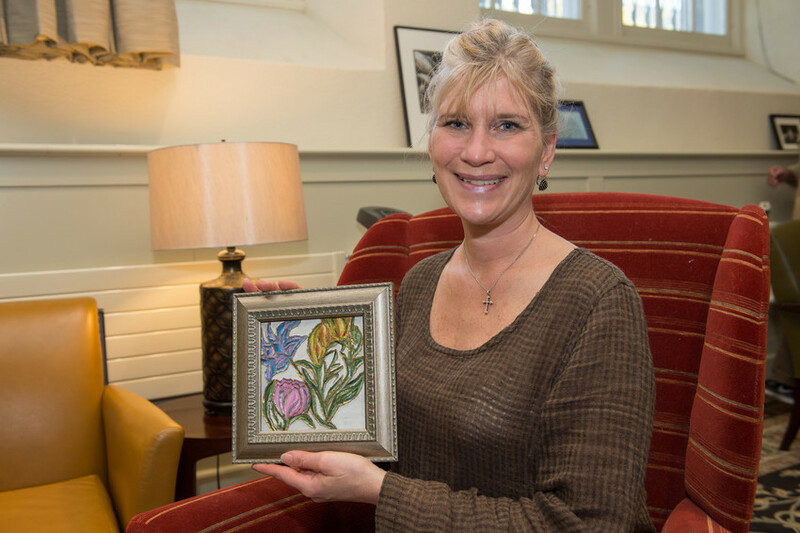 This spring, when she saw the posting for the On My Own Time exhibition for faculty and staff in the Noble Room at Hendricks Chapel, she decided to submit the artwork she created in Argentina. “I had always seen it every year, but I just hadn’t the time to really create anything,” Guanciale says. Her piece, “Floración Argentina,” was voted the Most Popular by visitors to the Noble Room. “I was surprised. It was really nice to be honored that way,” Guanciale says. Her future plans are to continue with art and pursue traveling. Her oldest son is headed to the Peace Corps and, at some point, she and her husband hope to meet up with him, possibly in Romania or Greece. “Definitely I want to do more trips—that’s my life dream,” Guanciale says. Kirstin Guanciale visited Iguazu Falls during her trip to Argentina.